After finishing her masters in environmental engineering at the University of Seville, Isabel Vázquez found herself unemployed. She spent eight months applying for positions all over Spain, but she only managed to get a couple of interviews. Disappointed, but not disheartened, she packed up her bags and left for Dublin, to work as an au pair for a year to polish her English. Now, five years and a PhD later, she’s researching synthesis and characterisation of a perovskite at the University of Liverpool. Her story is by no means unique – she’s one of many Spanish researchers who have traded their home country for better career prospects overseas. For most this will be a one-way trip. 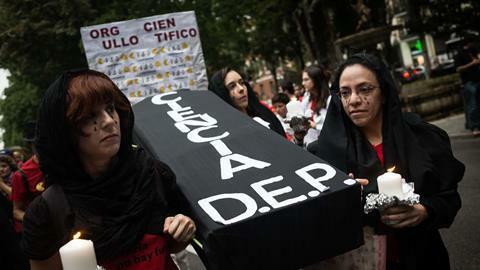 The 2008 financial crisis hit the Spanish research system harder than most. Spain lost 9% of its researchers, or 12,000 scientists, between 2010 and 2015, according to a 2017 European commission report. Young Spanish researchers trying to kick-start a career face a hostile structure laid bare by money constraints and excessive bureaucracy. The average age of a Spanish professor has shot-up: more than 45% of full-time researchers are now over 50, up from 39% in 2008. Recent figures show that 40% of researchers employed in R&D are on temporary contracts. There are now between 15,000 and 20,000 Spanish researchers abroad, according to Eduardo Oliver, an expert in expatriate talent networks at the COTEC Foundation. Before the crisis, he says, there were only around 10,000. Research in other southern European countries, such as Italy, has also been hit hard by the financial crisis. The Italian Senate estimated that, by 2015, around 12,000 researchers would have left the country – 10% of the nation’s total. A further 50,000 Italian academics are estimated to be working outside their home country. It was only a matter of time before she followed the growing stream of scientists that were leaving the country for the UK, Germany, Japan or the US. Julio Rodríguez obtained his PhD in 2015 – also from the University of Seville – and knew from the start he wanted to be a scientist. The financial crisis was receding and, having a competitive academic record, he thought he would have a good chance of getting a postdoc. According to the Spanish education ministry, over 20,000 PhD theses were defended in Spain in 2016, with around 25% in the sciences – a spectacular rise from the 9483 doctorates granted in 2011. During the financial crisis, the ratio of new doctoral graduates per full time researcher grew from 1.79 in 2010 to 2.28 in 2014, more than double the EU average. This is when newly minted graduates encounter their greatest stumbling block: the two largest publicly funded programmes offer just 400 postdoctoral research grants for all fields for the whole of Spain. ‘There is a real bottleneck right after reading your thesis,’ says Pablo Gómez, president of the Federation of Young Researchers (FJI), a nationwide coalition of researchers from all disciplines in the early stages of their careers. For Violeta Durán, spokeswoman at FJI, the problem is not limited to the scientific community, but one that effects the whole country. Spain, she says, can’t afford to lose the talent going abroad after investing in it. ‘We calculate we’re donating around 1.5% of our GDP to the destination countries,’ she says. The funding problems that have dogged science in Spain since the financial crash can be laid at the door of both the main political parties. However, the arrival of a new Socialist Workers’ Party government in June 2018 has been well received by the research community. The creation of a science ministry and the appointment of former astronaut Pedro Duque to lead it, have raised hopes. Young researchers and those abroad plan to wait and see whether the new government delivers on its promises before celebrating though. ‘We are hopeful but cautious,’ says Escudero, who welcomed the Duque’s stated intentions to increase the research and development budget and cut red tape. Gomez is sceptical about the new ministry’s intentions, however. ’When it was in opposition, the socialist party agreed to several points with the research community, but now we see they are forgetting about those. We understand the measures can’t be in place yet, but they should at least keep them on the agenda and they aren’t doing it. We can’t wait until conditions get better, because people are leaving now,’ he adds. ‘It wasn’t easy. I would have stayed if I had had the chance, but now I’m happy I left. Most of the people who studied with me are still in the same situation I was. Very few have managed to work in chemistry,’ Vázquez says. ‘When I left, my plan was to return,’ says Rodríguez, but he now thinks the future of science in Spain ‘looks pretty bleak’. ‘The competition for a spot is too high. When there’s an opening there are dozens of highly qualified applicants, and many of them have been working for free in the department for years. And even if you make it, the working conditions are too poor,’ says Rodríguez. This is a common problem for Spanish researchers abroad, who often find themselves having to accept worse conditions to return to their homeland.